Terra Australis - the southern continent had been “discovered” by Europeans already in 1606, but only in 1642 the size of the new “island” becomes clear and the first geological observations were made only in the early 19th century. October 1800 two ships – the “Geographe” and the “Naturaliste” – set sail from the harbor of Le Havre, France. Under the command of Captain Nicolas Baudin (1754-1803) geographers, astronomers, artists, naturalists, zoologists, botanists, and 2 mineralogists – Louis Depuch (1774-1803) and Charles Bailly (1777-1844) – were instructed to explore, map and eventually claim for France new territories of this new world. In the last moment also the young zoologist, and trained paleontologist, Francois Auguste Peron (1775-1810) joined the expedition. The geological observations made by Depuch (died during the expedition) are known from various reports send to Baudin. Bailly will publish some notes after his return to France and Peron included his research in the official report of the expedition. In May 27, 1801 the bare land of Cape Leeuwin was in sight and the naturalists went on land along the Wonnerup Inlet, where they collected the first specimens of Australian animals, plants and rocks. Fig.1. 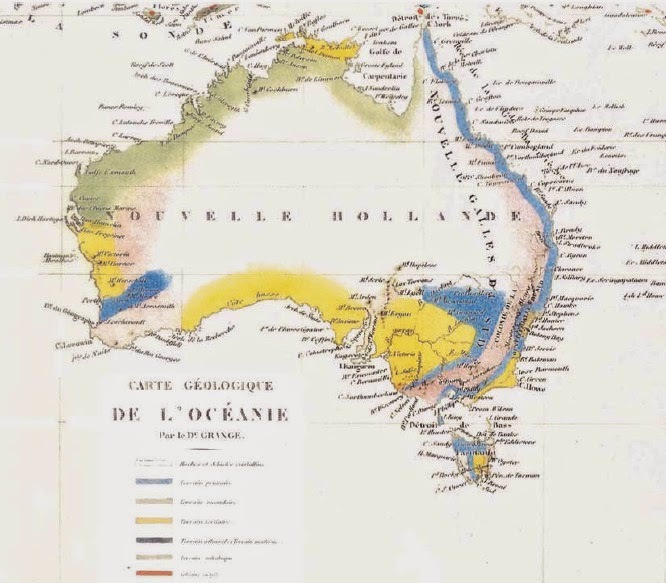 The “Baudin” – expedition, route drawn on Louis de Freycinet´s (1779-1842) “Carte générale de la Nouvelle Hollande”, published in 1811 as part of the results of the 1800-1804 expedition. A storm forced the men to remain on land for several days and one man died during a failed attempt to reach the ships (during the entire expedition 32 men died, 13% of the crew, a surprising low percentage considering the period). The storm separated the two ships, the “Naturaliste” proceeded to the island of Timor, a Dutch colony at the time, where the crew fell ill with Malaria and other tropical diseases. The “Geographe” approached in November 1801 the island of Tasmania, where the expedition will stay for three months. April 1802 the “Geographe” meet the British vessel “Investigator“. The expedition of the “Investigator” will map large parts of South-Australia and prove that Australia is one large continent, not two islands separated by a sea strait, as some geographers assumed. This was a disappointing discovery for captain Baudin, as there was no apparent geographic separation between the territories already claimed by British explorers, the entire continent had to be considered of British domain. The geologists Depuch and Bailly used a rock classification scheme, developed by the famous French geologist Déodat de Dolomieu, with four categories. They recognized primary rocks, such as granite; secondary rocks, such as stratified sandstone and limestone; alluvium (recent deposits) and volcanic rocks, such as basalt. The presence of these rocks in Australia was an important discovery, it proved that the classification scheme developed in Europe could be applied worldwide. Fig.2. Charles-Alexandre Lesueur´s and Nicolas-Martin Petit´s depiction of Van-Diemen´s-Land for the “Voyage de decouvertes aux Terres Australes“. The two young men – unskilled workers at the beginning of the expedition - were invited by Baudin to illustrate the logbook - both will become the most skilled artists for animal- and plantlife of the time. The granitic rocks found on the island of Tasmania convinced Peron and the other geologists that the most ancient – the primary – rock was Granite, forming the basement of all continents. Unfortunately the return to France will be disappointing for Peron. Captain Baudin dies on the island of Timor and French authorities will show little interest in the 220.000 samples of animals, plants and rocks, the 73 living animals, 3 kangaroos, 2 emus and 3 wombats brought back to Europe. Peron publish his report “Voyage de decouvertes aux Terres Australes” only in 1807, after a long struggle for money and dies just three years later, before the completion of the second volume. However the sea shells collected during the expedition will be studied by an important French naturalist – Jean-Baptiste de Lamarck. In 1804 Lamarck publishes his theory about the transmutation of species, based in part of the observation that the fossil shells found in the sediments of France are similar, but not identical, to shells of living molluscs collected in Australia. Fig.3. Peron discovers on the shores of Tasmania a living clam with a peculiar triangular shape – Trigonia antarctica – a genus of bivalve known only from fossils found in the sediments of the basin of Paris. He notes the similarities of this living specimen with fossil specimens – an important step to consider a relationship between fossil and extant species. Image of Trigonia sp. from Cretaceous sediments of Bavaria. Fig.4. Geological map by Jules Grange, published in 1850, surprisingly little was known of the geology of Australia until the 20th century.